Few teams in baseball history have captured the hearts of their fans like the Milwaukee Braves of the 1950s. During the Braves' 13-year tenure in Milwaukee (1953-1965), they had a winning record every season, won two consecutive NL pennants (1957 and 1958), lost two more in the final week of the season (1956 and 1959), and set big-league attendance records along the way. 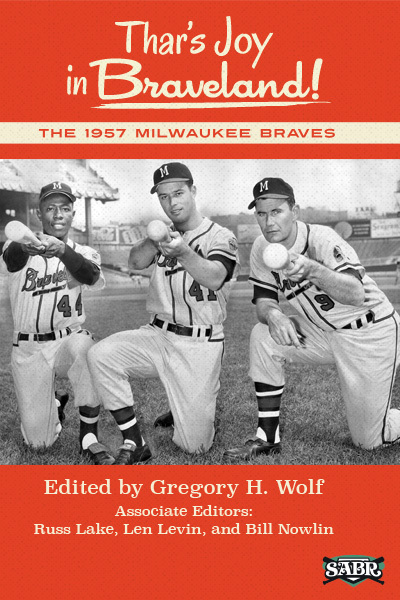 This book celebrates the Milwaukee Braves' historic 1957 World Series championship season. Led by the bats of National League Most Valuable Player Henry Aaron and slugging third baseman Eddie Mathews and the "Big Three" pitching trio (Cy Young Award winner Warren Spahn, Lew Burdette, and Bob Buhl) the Braves won 95 games. The team enjoyed standout seasons by shortstop Johnny Logan, outfielder Wes Covington, and catcher Del Crandall And GM John Quinn pulled off the biggest trade of the summer, acquiring All-Star second baseman Red Schoendienst from the New York Giants. The Braves cemented their place in history by defeating the New York Yankees in the World Series. In one of the greatest performances in the history of the fall classic, crafty Lew Burdette tossed his second consecutive shutout (and third complete game) to defeat the Bronx Bombers in Game Seven, in Yankee Stadium. A collaborative effort of 32 members of the Society for American Baseball Research (SABR), Thar's Joy in Braveland! The 1957 Milwaukee Braves portrays that memorable team with life stories of all of the roster players, the manager and coaching staff, the owner, the general manager, and sportswriters and radio announcers. Summaries of the regular season and World Series re-create the magic of that unforgettable season. E-book: Click here to download the e-book version of Thar's Joy in Braveland! The 1957 Milwaukee Braves for FREE from the SABR Store. Available in PDF, Kindle/MOBI and EPUB formats. Paperback: Get a 50% discount on the Thar's Joy in Braveland! The 1957 Milwaukee Braves paperback edition from the SABR Store ($15.99 includes shipping/tax). E-book: Click here to purchase the e-book version of Thar's Joy in Braveland! The 1957 Milwaukee Braves for $6.99 from the SABR Store. Available in PDF, Kindle/MOBI and EPUB formats. Paperback: Get the paperback edition of Thar's Joy in Braveland! The 1957 Milwaukee Braves from the SABR Store ($30.99 includes shipping/tax). For 40 years, SABR and its members have led the way in publishing the best baseball historical and statistical research. Our publications program is shifting to take advantage of new methods of publishing. Not only will we continue to publish new books like CAN HE PLAY? A Look At Baseball Scouts and Their Profession (released in December 2011); OPENING FENWAY PARK IN STYLE: The 1912 World Champion Red Sox (May 2012); Red Sox Baseball in the Days of Ike and Elvis: The Red Sox of the 1950s (September 2012); Detroit Tigers 1984: What A Start! What A Finish! (December 2012); Sweet '60: The 1960 Pittsburgh Pirates (April 2013); and Inventing Baseball: The 100 Greatest Games of the 19th Century (July 2013), which showcase the best efforts of SABR's members, chapters and committees, but new technology makes it possible for us to bring out-of-print titles like RUN, RABBIT, RUN: The Hilarious and Mostly True Tales of Rabbit Maranville (February 2012), GREAT HITTING PITCHERS (March 2012), NINETEENTH CENTURY STARS (August 2012); Batting (January 2013) and The Fenway Project (September 2013) back again. Books will be available in digital formats as well as paperbacks produced by "print on demand" (POD). This page was last updated October 31, 2017 at 8:15 pm MST.